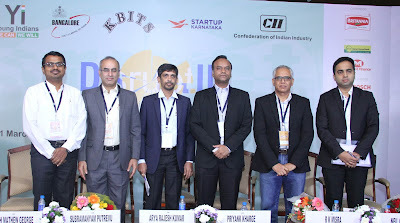 Young Indians (Yi) an integral part of the Confederation of Indian Industry (CII) organised the 5th National Entrepreneurship Summit in the city Themed ‘Disruption - Challenging Traditions, Transforming World’, the summit was inaugurated by Priyank Kharge, Minister for IT, BT and Tourism Government of Karnataka in the presence of Ajith Mathew George, Chair, Entrepreneurship Summit 2017, R K Misra Serial Entrepreneur, and Subramanyam Putrevu, CIO Mindtree Ltd and Arya Rajesh Kumar, Chair, Yi Bengaluru. Delivering the inaugural address, Priyank Kharge, Minister for IT, BT and Tourism Government of Karnataka said that, the Government of Karnataka has always pursued disruption and transformative governance. It strives to be bolder and better, with the most advanced digital ecosystem for its citizens. The various e-governance schemes of the government have been path breaking and disruptive whether it be Sakala Scheme, which guarantees services to citizens in the State within a stipulated time limit or the Bhoomi Project for land record management or the ‘Karnataka Valuation & e-Registration’ program to simplify the process of registration of documents. Today the government of Karnataka is acting as a consultant for other states in the implementation of e-governance. The state is has moved on from being the leader in e-governance to being a pioneer in mobile governance. ‘Karnataka One’ an award-winning application that integrates multiple government services into one app is an example of the forward-thinking policies of the government of Karnataka. Karnataka is the only State in India to have a start-up policy and a start-up cell to encourage and facilitate young entrepreneurs. The government is committed to provide financial, and policy support and mentorship to start-ups and this is the reason why start-ups have flourished in the state. Karnataka is the first state to have a grand startup challenge to promote and foster the spirit of ideation and innovation. The State is not worried about investments, as the government strongly believes that if adequate importance is given to ideation, innovation and invention will follow leading to investment. While stressing on the need to bridge the gap between academia and Industry, he said that New Age Incubation Network (NAIN) covering academic institutions have been setup by the government to encourage student projects through mentoring and monetary support of Rs. 3 lakhs per project for students in the rural areas. Already 180 student groups have been funded and there has been 70 company incorporations. Rajeev Chandrasekhar, Member of Parliament, Rajya Sabha, addressing the conference via video chat, said that innovation and disruption has flourished in the private sector but the government has lagged way behind. He called on the youth of the country to play and active role in the democratic process through an informed aware engagement and not just add to the common din. According to him innovation and disruption is the new normal and the internet and the technology the internet represents has created a level playing field. He said that, we have all the pieces to make India a great economic powerhouse but we first need to clean up our governance and make it more transparent. R K Misra, Serial Entrepreneur and winner of Lead India Campaign said that, disrupted industries typically suffer from a perfect storm of two forces. First, low barriers to entry into these sectors lead to more agile competition. Secondly, they have large legacy business models which often generate the majority of their revenue. These organizations, therefore, have embedded cultural and organizational challenges when it comes to changing at the pace required. Today’s fast paced techno driven business eco-system is fast evolving where mere innovation is not good enough for a business to survive, leave aside success. The new mantra is “Disruption”. In last decade where the focus was on innovation the next decade would be dedicated to disruption. Disruptive technologies are changing the game for businesses by creating entirely new products and services. 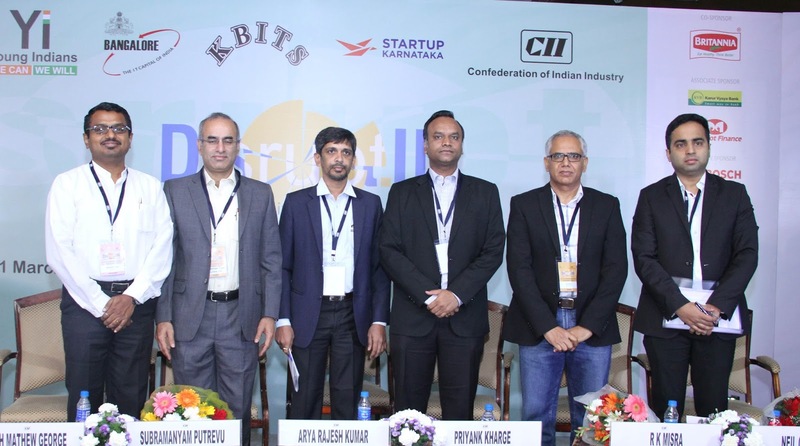 Subramanyam Putrevu, Chief Information Officer, Mindtree ltd said that Entrepreneurs and policy makers must not only know what’s on the horizon but also start preparing for its impact. It is estimated that these new emerging technologies could have a potential economic impact between $14 trillion and $33 trillion a year by 2025. This estimate is neither predictive nor comprehensive but based on an in-depth analysis of key potential applications and the value they could create in a number of ways, including the consumer surplus that arises from better products, lower prices, a cleaner environment, and better health. Ajith Mathew George, Chair, Entrepreneurship Summit 2017 said that today’s fast paced techno driven business eco-system is evolving where mere innovation is not good enough for a business to survive leave aside success. The new mantra is “Disruption”. In last decade where the focus was on innovation the next decade would be dedicated to disruption. Disruptive ideas are changing the game for businesses by creating entirely new products and services. Entrepreneurs have to keep their organizational strategies updated in the face of continually evolving technologies. They not only have to look for disruptive business models but also use technologies to improve internal performance. Digital India stands for transforming India into a digitally empowered knowledge economy. The summit will discuss about “Digital India” initiative of Govt. of India and the challenges & opportunities arising therefrom for Indian Entrepreneurs. It will also look at various schemes launched by Central and State Govt. for the start-ups and young entrepreneurs.